DOWNLOAD: Simple tip to boost your email open rates by 58%. You will be amazed at how simple, yet effective this strategy is. Success. Your download is on its way. You should receive your email download link within the next few minutes. Enjoy. Digital marketing professionals in today’s day and age must know how to master marketing automation. Mastering marketing automation is one of the most critical skills for all marketing personnel, especially those in the financial services industry. In fact, marketing automation is making its way across many different industries and sectors, and there’s an excellent reason for that. Marketing automation will help you automate your processes and allow you to use technology to move prospects along the sales pipeline. In a nutshell, Marketing Automation will help you maximise every stage of your customers’ journey, allowing you to move them towards a buying decision. Also, it will allow you to provide your sales team with those leads you would classify as warm or hot. Let’s have a look at the top 10 tips to master marketing automation. The first thing you need to be aware of is marketing automation is reasonably complicated. You’re going to need to be able to take your time and step slowly into this. Align yourself with the organisation that enables you to be trained up and get the skill sets necessary to master your marketing automation platform. Irrespective of what marketing automation platform you have (Marketo, Eloqua, HubSpot, Infusionsoft, ActiveCampaign or MailChimp), you must get the right training for your organisation. Someone needs to champion the integration between your CRM, your marketing automation platform and any other integration necessary. You must have one person who can understand everything about it, but can also document and train others on how to use it. Getting momentum with your marketing automation platform initially is a lot of hard work. Think in terms of pushing a huge boulder up a hill. The fastest way to get that boulder up the hill and over the top is to join the forum of your marketing automation provider. They may even have a Facebook group. Join that as well. Your journey is likely to take a solid 3-6 months of pushing the boulder up the hill. To shortcut the experience, join the groups and forums and make some friends along the way. They will definitely come in handy down the track. The forum is the best way for you to build your confidence up, to discuss your ideas and strategies with other people and hit the ground running. One of the challenges with marketing automation platforms is coming up with all the fresh ideas for new campaigns. The best way to get ideas is to ‘borrow’ them from companies who are currently successful at running their campaigns. Jump on their lists and become a student of the process. You will soon build up a ‘swipe file’ of great ideas, which you can leverage with your company for future campaigns. When I first started with marketing automation in mid-2013, I was using Eloqua. Eloqua is the top purpose built marketing automation platform. Fortunately, there was a company called Marketing Cube which ran marketing automation meetups. They ran small training events, brought in guest speakers and provided an opportunity to network with other people learning the marketing automation ropes, so to speak. The ability to speak with other people struggling and running into similar issues was brilliant. Your learning and growth will take off to a whole new level. 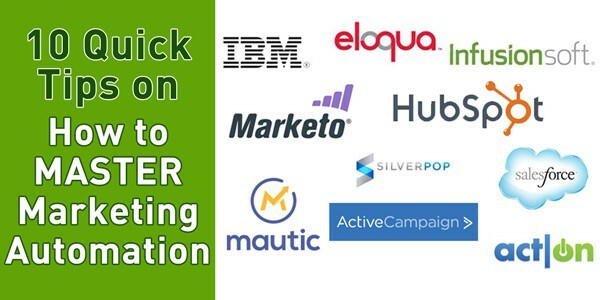 Jump over to Meetup and see if there is a marketing automation groups in your area. If there isn’t, create one. It will be well worth your time. You must get your first campaign successfully launched. An even better solution is to negotiate with your marketing automation provider and have them include your first campaign as part of your setup/training. When I first started with Eloqua, it was Marketing Cube who set up our first campaign. I’d estimate this saved us 2-3 months of time. Time we used to leverage their first templated campaign and build new communications and automations. Priority number 1 is to get your first campaign set up. Try and set up a multi-part campaign where you might have a little bit of automation in the backend. With your first campaign under your belt, it will be onwards and upwards from there. You will move quickly once you have ticked that box. The real key to marketing automation is to be able to template everything you are doing. From a lead generation point of view, the most valuable set of templates to setup is the landing page, thank you page and follow up email sequence. The time-consuming part about marketing automation is creating your initial base templates. The beauty of marketing automation is the amount of time you will save at the backend once you’ve got those original templates created. Segmentation is a powerful feature in marketing automation platforms. Click play on the video below to see the how powerful this email strategy is. Every single person coming into your funnel is hitting different pages on your site. Your digital team will have tracking pixels on every single page along with your marketing automation tracking. Everything is recorded. You will have a crystal ball into the browsing habits of your prospects. Segmentation allows you to pull a list of people that are very specific to that particular area. For example, if you wanted to know every single person that attended a webinar in the last 12 months, you can create that list. The likelihood is they like your webinars and are happy to participate in another one. You can then run a webinar segmentation report, create an email, and send them to the new upcoming webinar. Your open rates, engagement and click-through rates will be much higher. Running segmentation reports is such an important aspect for those looking to master marketing automation. In another blog post, we have talked about this. Essentially, you want to use the segmentation reports mentioned in tip seven to send your sales team your hottest leads. Marketing automation is very powerful in that it can run lead scoring. it highlights their engagement level. Your marketing automation platform will be able to ‘lead score’ them. The higher their engagement, the higher their score. You can then run a segmentation report and shoot off that list to your sales team. To take it to the next level, you can automate the emailing of these segmented reports. First, you sit down with your sales team to work out what type of leads they want. Then create the segmentation and automate the email to be sent daily or weekly to your sales manager. You are now sending your hottest prospects to your sales director. Leads can be divided among the staff, and everyone is happy. Over time, you might find that there’s a large group of people that are just not responding to any of your emails. One strategy you can run is an aggressive five part email series. This is where you will email them five to seven times over the course of 10 days, offering them a lot of value or asking them to purchase, get started or whatever your primary CTA is. At this stage, they are as close to lost as can be. So there is no harm in pushing for the sale or getting them to unsubscribe. You’re almost trying to solicit the unsubscribe. There is no problem with doing this as it will help convert some on your list and unsubscribe the others. You will then be left with a small list, which is more responsive. You must document every process you run. One of the key things I did early on was to record every process I ran. I did screen capture videos and documented everything in word docs. Now, marketing automation is quite tricky so you must record every single step you’re doing. The challenge with marketing automation is the length of time every single part of it takes. Document every step as a matter of priority. One of the best books to read on systemising your processes is The E-Myth by Michael Gerber. Michael is the guru in illustrating how to document and procedurise all your processes to become more efficient. With all your processes documented, you can then run an audit to see which tasks are your highest value and which are not. You can then delegate to the lower value tasks to your more junior staff and focus on those tasks which add the most value to your bottom line. On a regular basis, you need to be going through the emails using your marketing automation platform to find all those emails that are bouncing. Bounced emails are those people who signed up under their company email address and no longer work there. Or it could be an email they no longer use, so the emails keep bouncing. Find them and remove them. Simple. It may be a small task, but it is essential for those who are looking to master marketing automation. In conclusion, most companies underutilise the power of their marketing automation platforms. Hopefully, the 10 quick tips to mastering marketing automation (11 tips actually ;-))above get you inspired and maximise your investment in this technology. Set reasonable expectations and understand you are not going to be the guru in 30 days. But in 30 days you could have a suite of templates which drastically reduces the time to implement all your future campaigns. Now it is time to step up and master your marketing automation platform. The rewards are worth it. You spent way too long creating an impressive email campaign for 70% NOT to open it. Use this simple tip to boost your email open rates by 58%. You should receive your email download link within the next few minutes. Enjoy. Discover How to Boost Your Email Open Rates by 58%.